Princess Louise, Holborn,1986. Photo © Paul Barkshire. 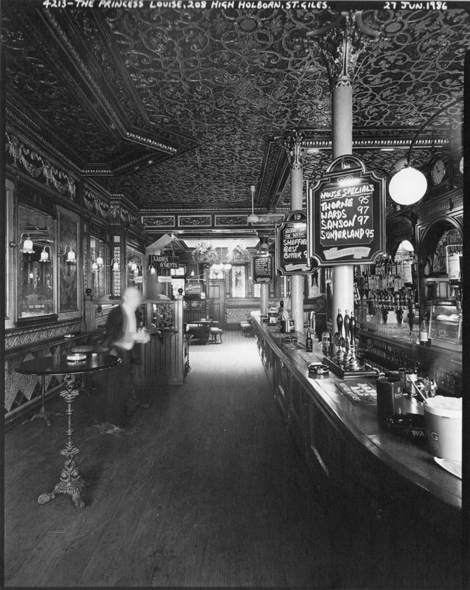 Since Paul Barkshire’s photo was taken in the 80s, the Princess Louise has had another make-over, reinstating ‘authentic’ Victorian mahogany & etched glass partitions, the original purpose of which was to divide up the patrons according to class and occupation. The end result is undoubtedly charming, and Sam Smiths should be congratulated for the sensitivity of their management of these historic pubs. The problem is that the loving restoration reinforces the sense of theme park, that creep of ‘Heritage’ (a tainted word if ever there was one) which imprisons London. The ghosts of the past are marooned amongst the tourists, and the centre of town is closed off to the truly louche and experimental. The Fitzroy Tavern and the Wheatsheaf can never be what they were in the 1920s and 40s; and where would The Rhymers’ Club, that austere flower of the Aesthetic movement which met at the Cheshire Cheese from the 1890s up to 1914, attracting Wilde, Yeats, Dowson, Pound, etc., meet today? A loft in Peckham or Dalston, probably. D.S.